From our central site in Greater Manchester, we manufacture the highest quality specification of PVC-U windows. The market leading, fully BBA certified, Eurologik PVC-U window system from Eurocell is an advanced, high performing and sustainable window system, offering leading energy efficient performance and aesthetics. The clean sight lines, unobtrusive gasket line and slim profile make the windows incredibly aesthetically pleasing. The Eurologik window system is specially designed for ease of use, with its unique patented knock-in bead and 70mm front-to-back dimension, fast replacement of existing frames has never been so easy. The post extruded gaskets use a specially developed compound and twin leg profile connection system which is tested to BS6375 standards, achieving exceptional air tightness and weather performance. The advanced 6 chamber designed profiles and ability to add thermal inserts gives superb energy efficiency and enhanced thermal performance, achieving U Values as low as 1.2 with a double glazed unit and 0.8 with a triple glazed unit. A+ Window Energy Ratings (WER) are achievable with Eurologik – offering market leading performance using argon filled units. The system is capable of an A+13 rating double glazed and A++20 rating triple glazed. Eurologik can be configured to accept both 28mm and 36 mm glazing thickness making it versatile for all your projects. Eurologik windows are available in both chamfered and ovolo finishes, with 11 colours available from stock and a further 35 colours available as made to order, it’s never been easier to meet your customers’ needs. All Eurocell products are perfectly colour matched so will suite in with any previous product installations. Eurocell are market leaders in sustainability and a dedicated recycling facility which processes post-consumer windows to turn them back into PVC-U recycled material that can be re-extruded into new profiles. The Eurologik window system has up to 50% post-consumer recycled content in the central core of the profile with a virgin PVC-U skin to maintain UV stability. Eurologik isn’t just one of the most advanced and sustainable PVC-U systems you can fit, it’s also a beautifully designed window and door system with slim, fully bevelled profile and clean sight lines to enhance properties of every type. So whether your customer is looking for a chamfered or sculptured finish for casement windows, French windows, tilt and turn windows or French doors, this fantastic systems gives you and your customers’ one of the widest choices on the market. With its sleek, contemporary lines, the innovative 9-in-1 Modus PVC-U system is a fully integrated window and door system allowing a range of different fenestration types and aesthetic styles to be made from the one system. This combined with a high security locked-in 6-chamber frame design Modus offers strength and resilience and style in abundance, whilst being cost effective. It was one of the very first systems to achieve the BRFC Window Energy Rating (WER) of A++ and is tough and durable, delivering superb air tightness, thermal performance and noise reduction. This effective thermal performance is due to the 75mm six-chamber design of the Modus profile system which achieves U-values as low as 0.7, the best energy efficiency rating of any window on the market today. The Modus system utilises over 50% post-consumer recycled PVC-U as standard, supporting the drive for a sustainable future. Modus is the most advanced PVC-U window and door system available on the market today, offering four different casement window sash styles; standard, slim, flush, mechanically jointed flush, tilt and turn, reversible, residential doors and French doors. With 11 colours available as standard and a further 35 additional solid and woodgrain-effect finishes available to order, that will colour match previous Eurocell installations, giving your customers greater choice and flexibility. For extra peace of mind the Modus system even comes with a 12 year guarantee. 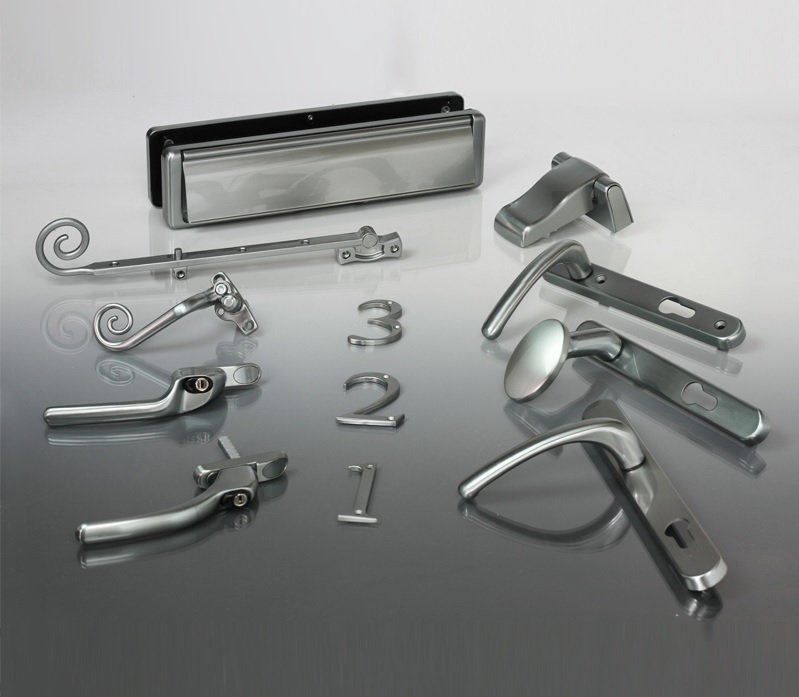 Gemini UPVC Ltd are proud to supply the ultimate in window and door hardware. Hardware may be the last thing fitted, but it's where the eye falls, the part we most frequently touch and operate, and the aspect by which we judge overall quality. When refurbishing your home, small details make all the difference. Choose perfectly matching hardware, not just in colour, but in design as well, providing the best finish to your refurbishment. Only FAB & FIX products are available in Hardex electro finishes - amongst the most resilient and attractive in the world today - built to last.